There used to be a time when the dogs never got people food in my house*. Well, except for baby carrots -- who withholds baby carrots from a dog with pleading eyes like Jon Farleigh and Dewi's? Not me, that's who. Anyway, (mostly) because we were trying to avoid the problematic begging dog at the table -- with the exception of the occasional raw veggie -- human food handouts were off limits. Good times, those days. Please oh please, get in my belly. Then one day I peeled a clementine (aka Cuties®, Halos®). (Note: I never used to buy clementines before they were marketed as Cuties.) I suppose it was the first time I'd ever done that in front of the dogs, because for some cockamamie reason (as my previous dog -- and only other canine reference point -- had been adverse to the taste of all foods grown from soil), Jon Farleigh and Dewi got a whiff of that delicate citrus bouquet, became spellbound, and looked at me with an intensity that I had only previously seen when cracking open a can of stinky cat food. What the fudge?! After about 11 peeled clementines over a few days (and by now, not only longing looks, but accompanying strings of drool from both dogs), I decided, what's the harm? Just like I know that coffee smells WAY better than it tastes (black), what better way to cure those dogs of begging for my clementines than to give them a taste? Bitter apple, anyone? Yeah, there was NO WAY they would ever beg for citrus after that. 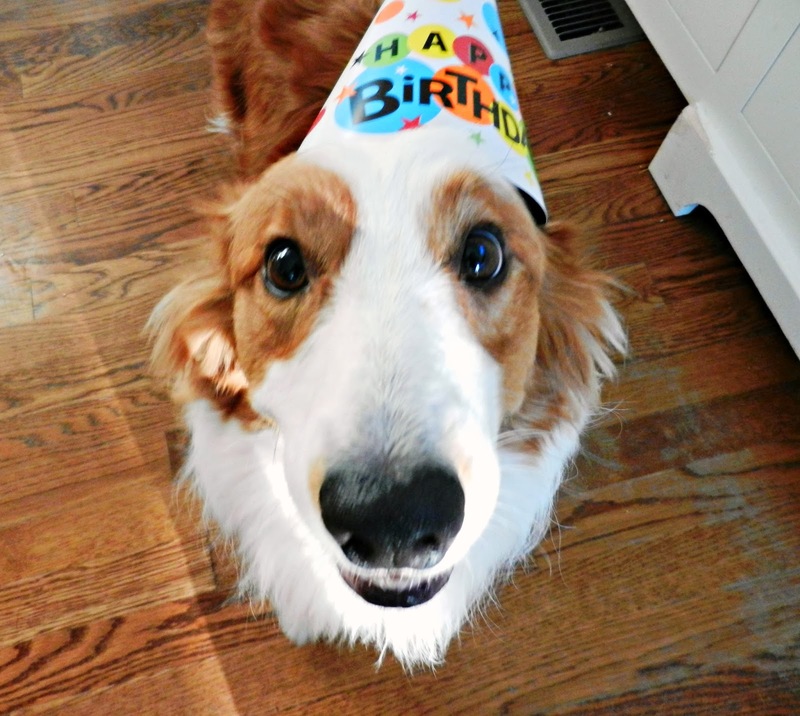 Excuse me, it is my birthday. Could you spare a dime...sized dollop of that thing you are eating? Except that they loved it. Slurped down those clementine wedges like oysters on the half-shell (which I won't eat, by the way, but happen to have a hunch that they would). And neither I, nor my my human family members, have ever been able to eat one in peace since. That slipper isn't even food, but I would greatly love to eat it. Hello. I heard you playing the Cheez-It song. Mind if I join you? 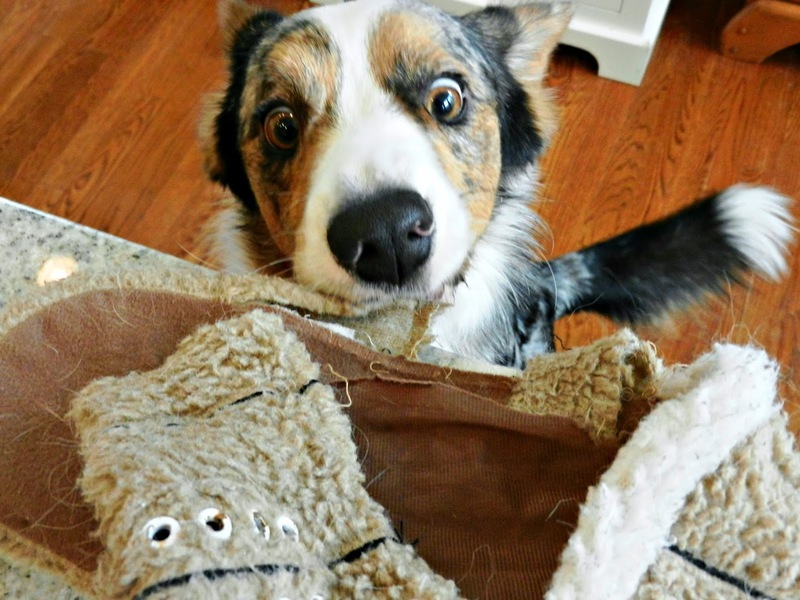 Have you ever caved in and shared something with your dog(s) that has since made your life "livelier"? * Obedience classes were a different story. 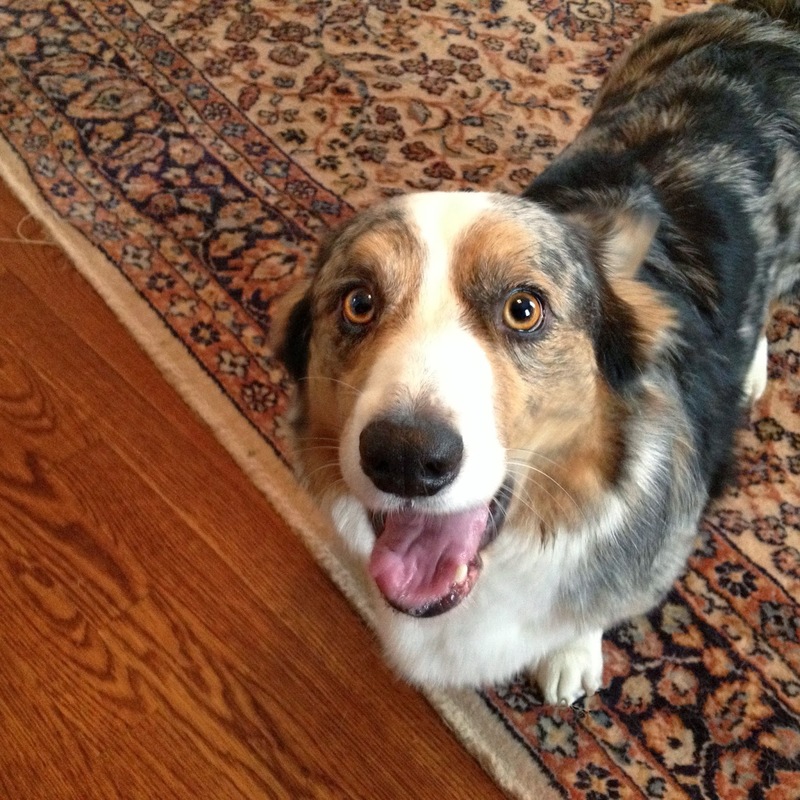 They (mostly Dewi) got people food in obedience classes (McDonald's cheeseburger, magic Oscar Mayer wiener, anyone?). It was my only defense! Also, peanut butter in a Kong doesn't count as people food. Second note (for other blog writers): See that title? Yeah, I wrote it that way as an experiment -- to see whether the "experts" on blog writing are correct in saying that that style of (trending) headline gets lots of attention. 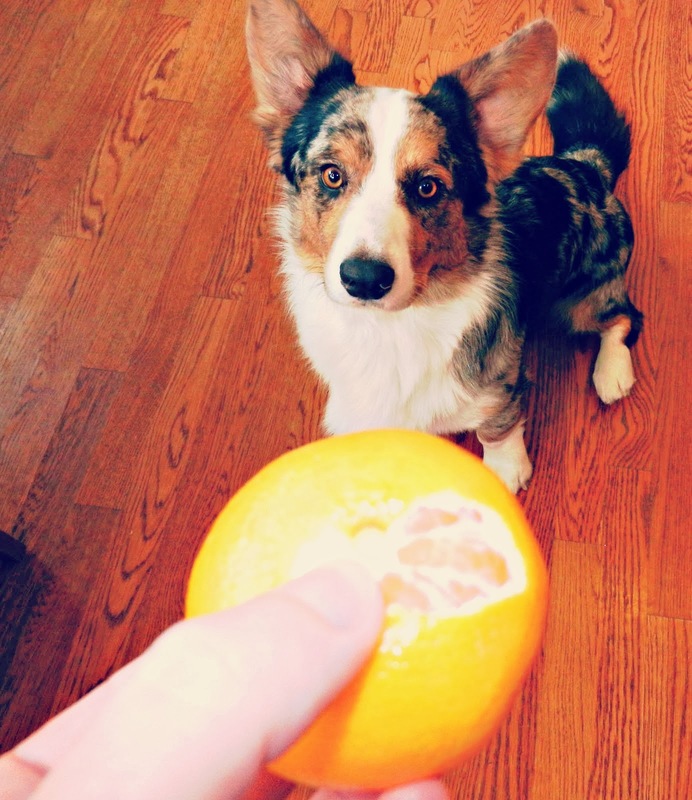 My original title was: "I Gave My Dog an Orange and Now I Can't Eat One in Peace." I think I can predict -- based on my own mental inclinations -- how this experiment is going to play out. By the way, I am NOT a fan of manipulative headlines (so don't expect to see me going over to the "dark side" any time soon). Cuties (now Halos where I live) are the best fruit to hit the stores in my lifetime. I mourn when they're out of season. :) Good luck with those fiends! Our beagle when I was growing up LOVED oranges. He would drool like crazy whenever you pealed one. So odd. I've never known another dog - except now your funny boys - to like citrus. Rita is like my Molly was. I could've given her a bucket of meat (hypothetically) with a green bean (or apple slice, etc.) hidden in it, and she'd eat every morsel EXCEPT the bean. Who knew dogs' tastes could vary so greatly! We share anything that the dogs want and is healthy for them. This includes veggies, fruits and lean meat. My old dog used to love grapes. It's funny when they like fruits. That, and he would eat anything. Oh yes! I love orange slices and all kinds of fruit, especially melons! Stay safe! If y'all end up with the kind of ice we're gettin' here in the deep south...I'm really slow and careful whenever I go outside. I am just amazed you held out as long as you did! Jon Farleigh and Dewey would have had me at opening the bag! They are so adorable.